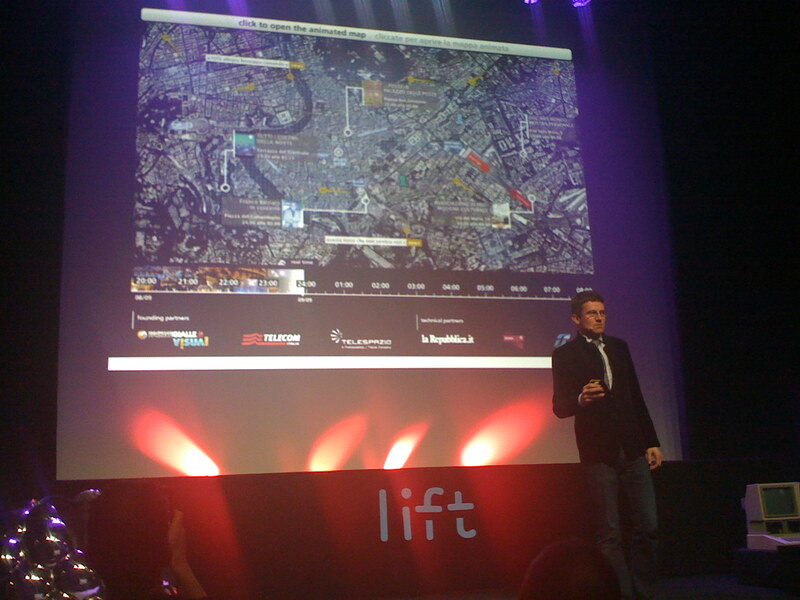 Carlo Ratti from MIT’s SENSEable City Lab also gave a really neat talk on dynamic visualizations within cities and the patterns that arise. Carlo showed engaging visualizations are a series of cities. Take the Real Time Rome project which aggregated data from mobile phones over different periods in Rome. The video represents the communication patterns across Rome during a Madonna concert. Carlo also showed an animation of “The Water Pavilion” located at the entrance to Expo Zaragoza 2008. Carlo and his team wanted to convey the sense of water in digital terms and therefore designed an interactive building made of water. Think of digital water like an inkjet printer on a large scale but with water instead of ink. This entry was posted in Uncategorized and tagged lift, LIFT09, MIT, Senseable, Visu, Visualization. Bookmark the permalink.